The authors from the class of 2001 are Mirta Ojito, Jonathan Englert, David Houze, Minal Hajratwala, Sarah Richards, and Matthew Sweeney. Jonathan Englert, a graduate of the Columbia University Graduate School of Journalism, also attended the Fordham University School of Law. He has written for a number of publications, including the New York Times and Catholic Digest. 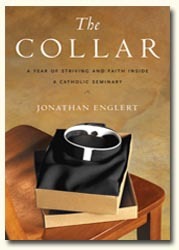 Two dioceses granted and then revoked access to Englert as he tried to report his first book, The Collar: A Year of Striving and Faith inside a Catholic Seminary -- in one case access was revoked after he had spent more than a year researching and reporting there. He persevered, however, and eventually found his way to Milwaukee's Sacred Heart School of Theology, where he completed the project. Under the pen name J.F. 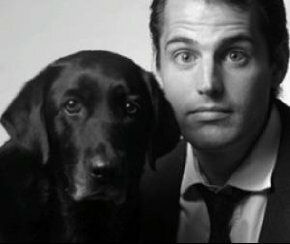 Englert, Jonathan has written three novels in the Bull Moose Dog Run Series: A Dog About Town, A Dog Among Diplomats, and A Dog At Sea, about a sentient Labrador retriever who, as Englert writes, "reads Dante and muses about the question of consciousness." Englert lives in New York with his family. "...readers will find his portrayal of priestly formation both compassionate and eye-opening, and it should be required reading for anyone thinking about becoming a priest." "...this work provides insights into the formation process for priests in modern America." "An engaging look inside a Catholic seminary dispels many mysteries...the reader's impression of these future priests is brightened by individuals who have overcome adversity and struggled with their calling, sometimes for decades and against great odds. The sexual abuse scandals necessarily color portions of the work, and readers get the chance to see from the inside how this tragedy affects those training for the priesthood. Issues of sexuality, celibacy in particular, are openly discussed, refuting many stereotypes along the way. In addition to examining his subjects' emotional and psychological makeup, Englert investigates their vocational calling and relationship with God. Puts a human face on the word 'priest.'" "AA great journalist and a great book always cut against the conventional wisdom. So it is with The Collar. At a time when coverage of the Catholic Church has centered on sexual scandal, conservative theology, and the steep decline in priests, Englert turns his reportorial attention and literary talent to those who still hear the call. This book is not naive or apologetic, but it is filled with empathy and wonder. ..."
"Poetry-loving, bon vivant dog detective Randolf returns (after A Dog About Town) for another installment of the Bull Moose Dog Run mysteries. ...Englert's droll mix of mystery, philosophical musing about man and beast, political doings at the U.N. and the mysteries of love make this an elegant, funny and inspiring romp in the park." Minal Hajratwala, writer, performer, and self-described “queer activist” was born in San Francisco and grew up in New Zealand and the United States – far from her family’s home in the Gujarat region of northwest India. 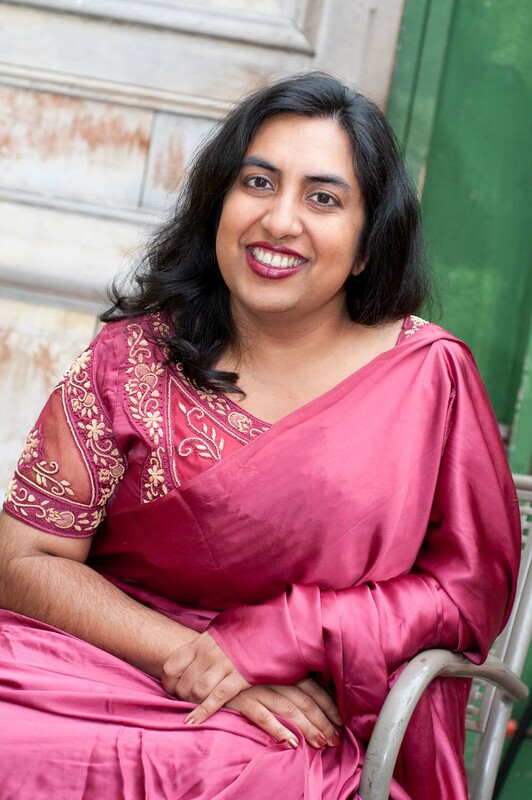 Her seven-year search to better understand her family’s migration across the world – beginning with her great-grandparents in their ancestral home in Gujarat and continuing today with aunts, uncles, and cousins in Africa, Australia, Europe, and North America – led to her first book, Leaving India, a important contribution to understanding the South Asian diaspora today. Hajratwala’s journalism career includes eight years as a reporter for the San Jose Mercury News and a year as a National Arts Journalism Fellow at the Columbia University Graduate School of Journalism. While there, she enrolled in Sam Freedman’s book seminar and began the project that became Leaving India. 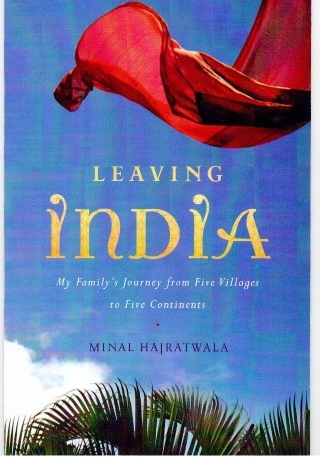 "I love Minal Hajratwala’s book Leaving India. It is what I imagine India itself to be like: incomparable, sprawling, rich, surprising, very old and wise and forever capable of recreating itself, no matter where pieces of it land." "Minal Hajratwala's Leaving India is a fascinating history that kept me up late into the night—and I suspect it will do the same for most readers. Filled with amazing and compelling family stories, it will strike a chord in anyone whose people have come from elsewhere -- and today, in America, that's most of us! I am filled with admiration at Minal's honesty and the careful beauty of her language. I learned so much, through the story of this one family, about the tragedies and triumphs of the Indian diaspora." "Told with the probing detail of a reporter, the fluid voice of a poet and the inspired vision of a young woman who walks in many worlds, Hajratwala’s story offers an engaging account of what may be one of the fastest-growing diasporas in the world."